Tip: Read Jack Wallen's Dolphin Tips and Tricks article as well. Click Settings > Configure Dolphin > General > and then select “Use Common properties for all folders” from the Behavior tab, under the ‘view’ subheading at the top (It’s what you’re staring at by default when you click “General.”) Now, any settings we make from here on out, will remain regardless of where you navigate. I like my file manager to have all my core information in front of me, without having to dig. The incorporation of the filesize of individual files, and the number of files in a folder, being placed under the names of files/folders is an incredible little enhancement that adds a whole slew of new information to your brain, that depending on your work at hand can be very useful to have! There have been so many times where I have been working on something back and forth between a terminal and graphical tools, that the incorporation of a Terminal inside my file manager was like someone gave a pizza cook the first roller knife thing. Needless to say, it’s become a staple of my workflow. Resize the terminal to fit as you desire, and now have easy access if ever needed! This one is obvious. Your home folder is like your C:/Username/ directory in Windows, with your documents, downloads, pictures etc. But the home folder is also kinda like your /Program Files/ folder too, containing a lot of information from installed software. Actually, the vast majority of space used, and sensitive information, is located in your home folder. That said, you’ll want to be able to properly view everything in the home folder, which is hidden by default. Being able to directly type the location you want, is handy for obvious reasons. Nuff said. There are two buttons at the top of the window, for “Preview” and “Split,” I usually run with both of these selected as well. Preview, shows thumbnails on the files and the side of the screen (Super useful for me as someone who deals with a lot of photographs and images), and the split button gives me two sections of file manager, for easy copy/paste/comparisons. Now you: Do you have any other tips / tricks you use for Dolphin? Let us know in the comments! 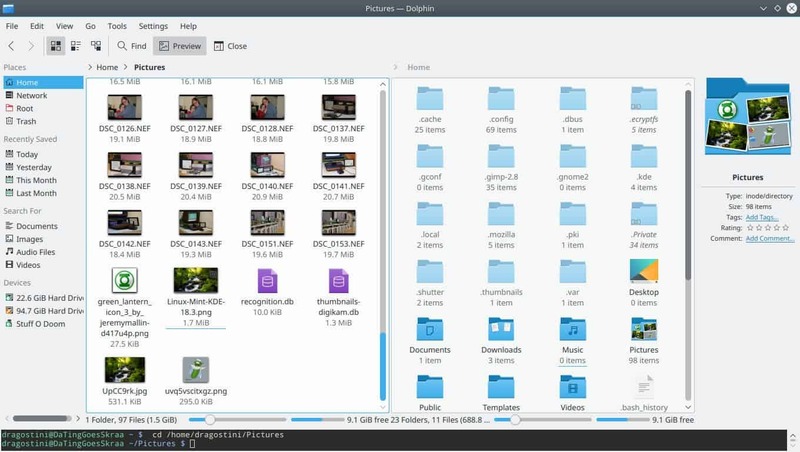 Mike shares his favorite KDE 5 Dolphin File Manager tweaks and configuration changes to customize the file manager and improve your workflow. Dolphin is one of the best file manager I’ve even used in Linux and it’s getting better and better on every KDE release! Mike, can you suggest “best place to learn about available Dolphin addons”? I’m unsure of the proper term. Services? Service addons? Personally, I’d say that the KDE store is indeed a good place to find addons for Dolphin. I don’t have any preference for third party websites with said addons, because truthfully I spent more time in a terminal for file management, than I do in Dolphin. But, poking around in the store just now, there’s a few things I spy that I might check out myself. I am very much obliged to you for this really well written en highly informative article again. I am wondering or I can (and also should ) use in a Windows 10 environment? Do you maybe also know the safest download link for Windows and Linux? I did run KDE under windows back in the win xp days. It was not the elegant solution. Running any kde based program meant downloading the entire framework. Back then this took all day to install. The list of packages was endless. I tried Kate text editor. Its good that there are some seperate binaries. But like you wrote it seems the KDE for windows has gone silent the last year. There is no binary for Dolphin at least what I can see..
For linux you just go to the repository of your distro and install all base kde packages and then install dolphin. I will stick than to main freeware file managers like there are Tablaus explorer, FreeCommnaderXE, and double commander. Luca, Thanks for the tip. I was not familiar with this file manager and I have already installed it and up to right now I like what I see. Are you also familiar with free programs like unreal commander, total commander, multi-commander, Konvertor, EF Commander, Directory Opus and Ablacus Explorer? When you familiar with other file managers I really like the here from you (on anybody else). I use FreeCommander when I need to do anything other than basic file management (in W7). The Mass Rename tool is excellent. Speaking for KDE, Falkon 3.0.0 (Ex QupZilla) released! I’m a fan of Dolphin. I didn’t realize that the switch from Konq was controversial — I viewed it with relief, because Konq has never given me anything but trouble. Dolphin is trouble-free for me. Nice article. Only problem with KDE software is that it works best in KDE (many dependencies). Also wasn’t Dolphin file copy dialog integrated in the Plasma shell? Maybe they have removed that now, because that’s not good when using Dolphin in another DE. I don’t think it’s possible to use Dolphin as root anymore. Feels a bit like the developer is creating artificial limitations here. Otherwise Dolphin is great. You can use Dolphin as root with the version that is in the current Debian repository.